Objective: To explore clinical efficacy of forearm skin defect repaired by anterolateral thigh flap combined with external fixation. Methods: Twelve patients hospitalized in Jinshan hospital with forearm skin defect from October 2008 to June 2013 were retrospectively analysed. Area of forearm skin defect ranged from 9.5 cm × 4.5 cm to 20.5 cm × 12.0 cm. Ten patients were operated with emergent debridement, repairing blood vessels, nerves, muscles and fixing bone fracture within 8 h after broken called as the first phase. Twelve patients were repaired forearm skin defect used anterolateral thigh flap within 10 days called as the second phase. Results: Average follow-ups time was 15 months. Cut scope of flap ranged from 11.5 cm × 5.5 cm to 25.5 cm × 14.5 cm. Wound of 10 patients were healed in first phase and healing time were 14-18 days. 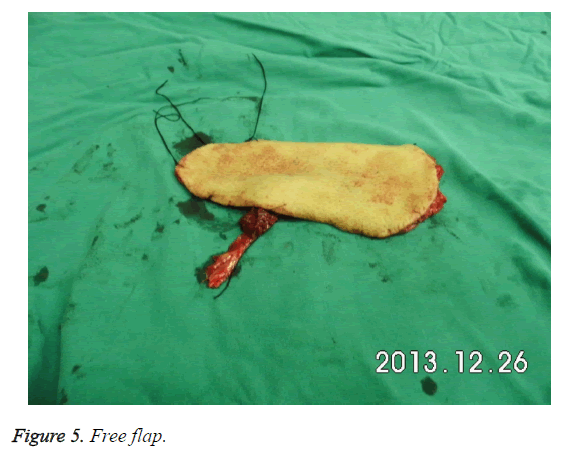 Free flap and skin-grafting were survived perfectly, and the active activity of f wrist was normal. Although 1 patient was with part of flap necrosis, wound was healed through changing drug in the second phase. In addition, 1 patient had flap necrosis at the 3rd day after the surgery and recovered after surgery of ipsilateral pedicled groin flap. The fineness rate was 92.7% (11/12). Conclusions: External fixation can effectively fix open fractures of forearm injuries and provide more time to flap surgery. Anterolateral thigh flap is the ideal flap to repair forearm skin defect combined with muscles and bone exposure, which characteristics were anatomical fixing position, high survival rate and good recovery of forearm function and appearance. Along with the development of industrial production in China in recent years, increasing trend of hand injury ratio in industrial accidents appeared significantly which some reports showed that the data was 49.7%~76.0% . At present, the treatments for skin and soft tissue defects of hand or forearm were directly skin-grafting or surgery of ipsilateral pedicled groin flap. However, they both have their drawbacks: (1) survival rate of directly skin-grafting and resistance to infection are low. And no subcutaneous fat can separate bone, muscle, blood vessels, nerve and skin. The recovery of appearance and function in hand is the worst. (2) Surgery of ipsilateral pedicled groin flap can repair skin defects of hand. But the hand has to fix with body for a long time and patients can’t insist on for pain caused by the surgery. In addition, the surgery needs to be done twice for cutting flap and flap always appeared bloated after the surgery. Severe trauma in upper limb often combines with different degree of fracture and (or) skin and soft tissue defect . Infection always happened after the surgery and sometimes even had big wound and exposure of fixation and bone. That is a difficult problem if wound can’t heal well. Primary requirement of long-term curative effect after transfer of flap are rebuilding sensory function and increasing abrasion performance of flap . Twelve patients hospitalized in Jinshan hospital with forearm skin defect from October 2008 to June 2013 were enrolled in this study and were all operated with anterolateral thigh flap. They were consisted by 7 males and 5 females whose average age was 39 year-old (24-58). Skin defect of four patients were on the left side and others on the right side. Area of forearm skin defect ranged from 9.5 cm × 4.5 cm to 20.5 cm × 12.0 cm (Figure 1). Among them, simple skin and soft tissue defects were in 7 patients, 2 cases combined with fracture in 1/3 of distal radius, 1 case with fracture in middle ulna, 4 cases with muscle damage, 3 cases with vascular and nerve injury. Ten patients were operated with emergent debridement, repairing blood vessels, nerves, muscles and fixing bone fracture within 8 h after broken called as the first phase. Twelve patients were repaired forearm skin defect used anterolateral thigh flap within 10 days called as the second phase. Figure 1. Situation of one patient on admission. 51 year-old male patient was sent to hospital when he was twisted by spinning machine on right arm 2 h later. 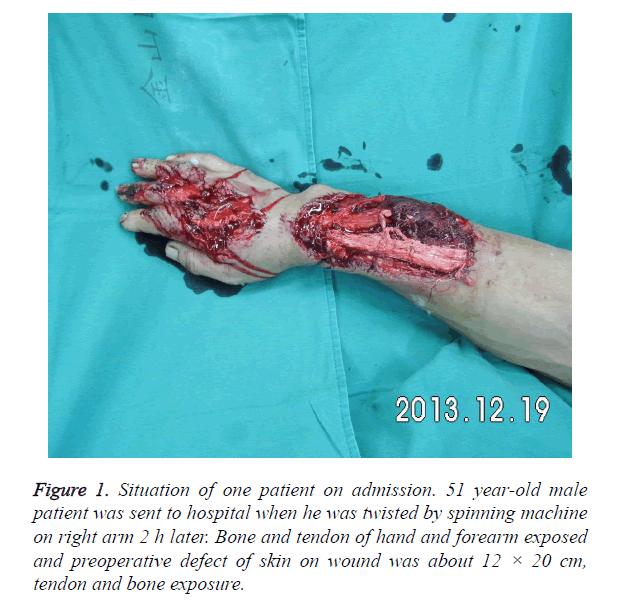 Bone and tendon of hand and forearm exposed and preoperative defect of skin on wound was about 12 × 20 cm, tendon and bone exposure. This study was approved by the ethics committee at our hospital and was conducted in accordance with the provisions of the Declaration of Helsinki, Good Clinical Practice guidelines, and local laws and regulations. Allen's test was operated to check the blood supply of limb. Radial and ulnar arteries were pressed with clenched-fist, and then one side of radial artery was released. If the color of hand came red back from radial artery to ulnar artery which means blood supply of radial artery is good and Allen's test showed negative result. Conversely, blood supply of ulnar artery can be got. If ulnar artery or radial artery is not smooth, side-to-end anastomosis of artery maybe needed during the surgery. Arteriae perforans prima in descending branch of lateral femoral circumflex artery is always located in the circle which diameter is 3 cm and center is midpoint of line linking anterosuperior iliac spine with superior margin of lateral patellar. Thus, tape can accurately measure the flap position. Other tests include routine blood indexes, bleeding and coagulation time, chest radiograph and electrocardiogram (Figure 2). Blood should be prepared if necessary. Figure 2. X-ray film before surgery. a. Anesthesia and posture: Patients were given general anaesthesia with indwelling catheter and assumed the supine lying posture. Affected limb was extended on the table. Pneumatic tourniquets were used with affected limb and thigh when anterolateral thigh flap was dissociated in second phase. b. Debridement, match and fix: Wound in affected limb should be debrided thoroughly during emergency. And the location of proximal in coarse subcutaneous vein should be noted to check injury of ulnar artery and radial artery. If injury exists, accurate repair should be done to ensure the survival of limbs. If the length of artery is not long enough, saphenous veins in medial leg can be transplanted as material. Injury of muscles and tendons can be treated in first phase. 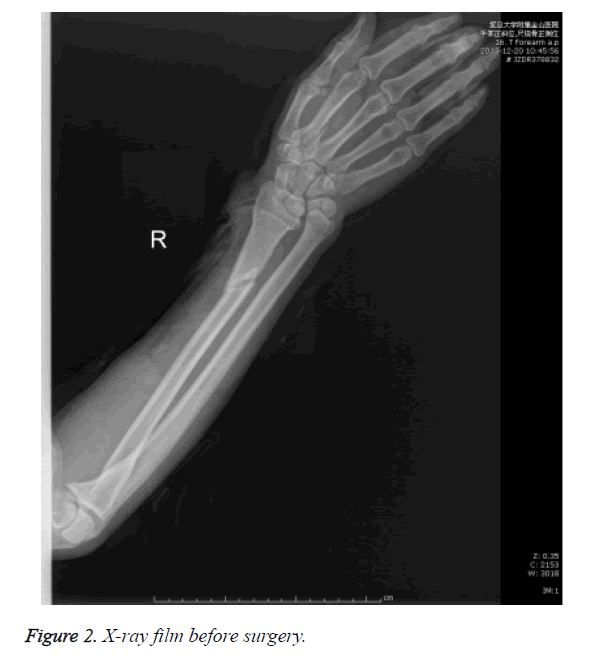 If there is a fracture, fracture reduction should be done firstly. Fracture was fixed with external fixation. One side of external fixation was fixed on second metacarpal bone and another side was fixed on radius to keep wrist in correct position (Figure 3). Wound was protected with Vacuum Assisted Closure (VAC) firstly and then with interval suction after the surgery. Daily washing was done for preventing infection. Patients in this research were all treated with VAC for preparation of anterolateral thigh flap in second phase. Figure 3. Situation of affected limb before surgery. c. Donor flap: The opposite thigh of affected limb was chosen as donor. Area of donor flap should larger 10%-20% than area of the wound. Midpoint of the line linking anterior superior spine and margo superior of lateral patellar was designed as piercing point A, which 2/3rd of donor flap should be outside of the line and below A level (Figure 4). Figure 4. Design of flap: anterolateral thigh flap of left thigh. Depending on above design, donor flap was got with 3 cuts. First cut: cut arc incision located lateral lower flap and make the skin and deep fascia cut together with stopping bleeding by bipolar electrocautery. In order to prevent injury of perforator vessel, fat layer and deep fascia must be sutured and fixed. Along with deep fascia, anatomy was done inward with stopping bleeding until that arteriae perforans prima in descending branch of the lateral femoral circumflex artery was found. If the location of arteriae perforans prima was not in dot A. Location of donor flap can be adjusted with unchanged size and shape. Second cut: cut arc incision located lower flap and others were the same with before. Along with the found arteriae perforans prima, donor flap was cut further to meet descending branch of lateral femoral circumflex artery found in third cut. Third cut: cut arc incision located top flap and be careful with subcutaneous fat to make lateral femoral cutaneous nerve long enough for coinciding with cutaneous nerve of receptor which can better recover sensory of flap (Figure 5). Descending branch of lateral femoral circumflex artery was dissected along with interscalene between rectus femoris and vastus lateralis. If perforator was musculocutaneous artery, muscles of 1-2 cm outside perforator should be kept and muscle fibers were cut carefully. In general, two satellites exist beside lateral femoral circumflex artery. When blood vessels appear spasm or become thin during the surgery, 2% lidocaine and warm saline can be used by local wet compress. d. Wound repair: Donor flap was temporary fixed to donor area with descending branch of lateral femoral circumflex artery. Recipient sites were debrided, stopped bleeding and ensured specific location of coincided arteries and veins. After everything was ready, vascular pedicle of donor flap was cut quickly. One team treated donor area with ligaturing vessel and suturing subcutaneous, skin. To prevent osteofascial compartment syndrome, sutures should not be too tight. If the skin was not enough, full thickness skin graft or local extension incision skin graft in belly can be removed for coverage. Another team sutured, fixed free flap with skin of recipient site partly and accurately coincided arteries and veins (Figure 6). At this moment, the color of flap turned red from white and edge of flap had capillary hemorrhage. At last, sutures of remaining skin were done and a number of skin grafts were placed for drainage. During bandaging with dressing, watch window should be set up for observing blood supply of flap after the surgery. Figure 6. Situation of affected limb with free flap at 0 week, 2nd week, and 6th month. Patients had to stay in bed for 7-10 days after the surgery and used lamp to keep warm when room temperature should be controlled in 24°C-26°C without smoking. Meanwhile, patients were treated with drugs for preventing infection, spasm, pain and blood stasis. Blood supply should be observed carefully. Skin grafts were removed during 24-48 h and stitches were taken out from 2 weeks after the surgery (Figure 6). Because of external fixation, plaster slab can be omitted (Figure 6). Function and appearance of hands were evaluated by assessment standard of upper extremity function . It is a comprehensive evaluation with movement, feel, appearance and function. The score of 13-16 was seen as great, 9-12 as good, 5-8 as ok and ≤ 4 as bad. Twelve patients had completed the surgery smoothly and average time was 8.0 h (6.0-9.5). Area of free flaps was between 11.5 cm × 5.5 cm and 25.5 cm × 14.5 cm and cut scope of necrotic flap was the smallest. All patients were followed up for 6~24 months which average was 15 months. Results showed that 10 cases (83.3%, 10/12) were evaluated as great. Wound healed time was 14-18 days. Flaps and skin grafts survived completely. One year later, the appearance of forearm flap was full, ruddy and the scar was not obvious. Sensory nerve recovered satisfactorily which twopoint discrimination test were 4-8 mm. Sweat test results obviously and sensation of touch, pain and temperature recovered satisfactorily. Activity of active flexion and extension, ulnar deviation and radial deviation in wrist reached the normal range and patients completely returned to normal life and work. One case (8.3%, 1/12) was evaluated as good. Flap was basic survival with partial necrosis of distal. After the change of dressing, wound healed in 18-24 days. One year later, the appearance of forearm flap was full and ruddy. Recovery of nerve was less satisfactory which two-point discrimination test were 5-9 mm. Sweat test results less obviously and sensation of touch, pain and temperature recovered less satisfactorily. Activity of wrist was limited 5°-10° and patient recovered basically to normal life and work. One case (8.3%, 1/12) was evaluated as bad. Due to embolism of anastomotic vein after the surgery, vein circumfluence was limited. After exploration and invalid re-anastomosis, flap was completely necrotized after 3 days of the surgery. Thus, surgery of ipsilateral pedicled groin flap was re-done and the pedicles were separated 4 weeks after the surgery. Flap survived well but function of wrist was limited obviously. Meanwhile, hand function recovered poorly. For closed fractures of extremities, doctors advocate using treatments at present such as open reduction and internal fixation, closed reduction with small incision, Kirschner wire or intramedullary nail. However, emergency often encounter patients with severe open injury which often accompanied by fracture, injuries of vascular, nerve, tendon and defect of skin and soft tissue. If internal fixation with plate for fracture after debridement is selected at this time, risk of surgery will increase. That is because internal fixation can increase local tissue injury and have to be moved out losing fixed effect if wound infection, tissue necrosis appeared after the surgery. Patients in this research were all with open injury of upper limb and part of patients were with both fracture and defect of skin and soft tissue. We adopted external fixation and applied VAC with the wound to prevent infection effectively after the surgery . Meanwhile, if there is a blood vessel injury, through early vascular anastomosis, we advised reanastomosed blood vessels should be embedded in the local soft tissue, which can be protected by VAC and without injuries. External fixation was not only beneficial to limb fixation, but also conducive to reduce trauma. Application of VAC to observe wound healing was propitious to repair wound in second phase. Anterolateral thigh flap was first reported by professor Song et al. and has been widely used in clinic for constant vascular pedicle, simple surgery, big wound repairing area and little damage for donor site [7-9]. Function and appearance of upper limb in this research all recovered well. For large area defects of skin and soft tissue in upper limb, method of anterolateral thigh flap combined with external fixation has obvious advantages: (1) In line with tissue transplant principles of "good reconstruction of affected area and minimal damage of donor zone" . Descending branch of lateral femoral circumflex artery and vein in this flap is thick, location is superficial and constant, surgery is simple, and flap are with long vascular pedicle and thick diameter which has little chance of anatomic variation and cut easily according to the need. (2) Wound in upper limb was repaired with flap cut from corresponding parts of lower extremity which meet reconstruction principles of "filling what and how many was missed". Main blood vessels in recipient site can be repaired with blood vessels in donor site. (3) Function of lower limb after flap was cut was not affected greatly. (4) Donor site is concealed, color is similar with recipient site, and thick skin is good for abrasion during long time working and learning of upper limb. (5) Blood supply of flap is rich and flap survived easily. Cutaneous nerve of recipient site also can be coincided. Appearance of flap after the surgery is good with suitable thickness. Sensation recovered well contributing to better recovery of function in upper limb. (6) At the same time, compound tissue flap can be cut to meet the demand of repairing compound trauma in upper limb. Of course, we should pay attention to some disadvantages during the surgery: (1) Operated doctors must have exquisite microsurgical anastomosis technique that needs to undergo a rigorous training. (2) Anatomy of musculocutaneous perforator is the key to success. Thus, any slightly intraoperative damage to the perforator will result in the failure of the surgery. The key to success of cutting anterolateral thigh flap is careful anatomy of musculocutaneous perforator . In order to improve the success rate, we should pay attention to the followings: (1) Sufficient preoperative preparation, understanding of vascular injuries in affected limbs, and no damage of skin in donor site. (2) During the surgery, no matter donor site or recipient site should be operated with tourniquet to keep the field of vision clear for preventing failure caused by accidental injury of vascular pedicle and perforator. (3) The lateral margin of flap was incomplete cut firstly. Lateral femoral circumflex artery and vein were along with interscalene between rectus femoris and vastus lateralis which was under deep fascia. To prevent injuries of artery and vein in perforator caused by separation of skin and deep fascia, skin around flap and deep fascia should be discontinuously sutured and fixed when cutting. (4) Midpoint of the line linking anterior superior spine and margo superior of lateral patellar was designed as piercing point A, which 2/3rd of flap should be outside of the line and below A level. (5) Lateral femoral circumflex artery mostly came out from rectus femoris between vastus lateralis. If vascular anatomy is difficult during cutting, realignment can be adopted to free blood vessel and careful for artery and nerve. (6) Before transfer of flap, location and sufficient length of blood vessel in recipient site should be confirmed once again and then pedicle was cut. (7) External fixation should be used after the surgery. So, external fixation is a good choice for this kind of open injuries. Serious injuries of upper limbs are common in clinic and operative methods to repair them are also quite a lot including pedicled omental flap, thoraco-abdominal skin flap, anterolateral thigh flap, dorsal metacarpal artery reversed island flap and forearm fasciocutaneous flap [12-15], which all have its advantages and disadvantages. External fixation can effectively fix fractures caused by open injuries of forearm and provide good support for surgery. VAC can effectively prevent infections of wound. Anterolateral thigh flap is an ideal flap for repairing defect of the skin and soft tissue associated with exposure of muscle and bone. It has the characteristics of constant anatomical location, high survival rate, good postoperative recovery of function and appearance of forearm. Thus, anterolateral thigh flap is an ideal flap to repair defects of large area in upper limb. All data and experiments were done by my team. Here we thank professor Pu and professor Cheng for energetic support and help in the process of experience. Thank you, Dr. Kang and prof. Wang from Department of Brain and Neurology. I really very much appreciate your years of guidance and help. This research received no funding from any organizations. Lin J, Rui Y, Wei S, Yao G, Jin K, Liang Y. Case crossover study on acute occupational traumatic hand injury. Chin J Industr Hyg Occup Dis 2007; 12: 126-127. Ono S, Sebastin S, Yazaki N, Hyakusoku H, Chung K. Clinical applications of perforator-based propeller flaps in upper limb soft tissue reconstruction. J Hand Surg Am 2011; 36: 853-863. Shaw RJ. Unprimed stem completion is only moderately predicted by word frequency and length. Behav Res Methods Instr Comp 1997; 29: 401-402. Pan S, Gu Y, Shi D. Assessment standard of upper extremity function in Chinese Medical Association of hand surgery. Chin J Hand Surg 2000; 16: 130-135. Kneser U, Leffler M, Bach A, Kopp J, Horch R. Vacuum assisted closure (V.A.C.) therapy is an essential tool for treatment of complex defect injuries of the upper extremity. Zentralbl Chir 2006; 131: 7-12. Song YG, Chen GZ, Song YL. The free thigh flap: a new free flap concept based on the septocutaneous artery. Br J Plast Surg 1984; 37: 149-159. Kimura N, Satoh K. Considerations of a thin flap as an entity and clinical applications of the thin anterolateral thigh flap. Plast Reconstr Surg 1996; 97: 985-992. Gharb BB, Salgado CJ, Moran SL, Rampazzo A, Mardini S. Free anterolateral thigh flap in pediatric patients. Ann Plast Surg 2011; 66: 143-147. Lin DT, Coppit GL, Burkey BB. Use of the anterolateral thigh flap for reconstruction of the head and neck. Curr Opin Otolaryngol Head Neck Surg 2004; 12: 300-304. Sixty-Third World Health Assembly, World Health Organization. WHO Guiding Principles on Human Cell, Tissue and Organ Transplantation. Cell Tissue Bank 2010; 11: 413-419. Rai SM, Grinsell D, Hunter-Smith D, Corlett R, Nakarmi K. Microsurgical free flaps at Kathmandu Model Hospital. J Nepal Health Res Counc 2014; 12: 100-103. Pelton JJ, Milbourn CT, Parsons TR. Circumferential forearm fasciocutaneous free flap reconstruction of forequarter amputation/chest wall resection using simultaneous extra-anatomic revascularization (SEAR). Ann Surg Oncol 1998; 5: 557-560. Small JO, Brennen MD. The second dorsal metacarpal artery neurovascular island flap. Br J Plast Surg 1990; 43: 17-23. Hirshowitz B, Moscona R, Har-Shai Y, Kaufman T, Kalderon N. The extended use of the transverse abdominal skin (tras) flap, anatomical and clinical considerations. Eur J Plastic Surg 1987; 10: 11-17. Wolf Y, Cohen M, Weiss J, Klausner YM, Meller I. Pedicled omental flap and skin grafting to cover artificial mesh. Eur J Plastic Surg 1997; 20: 154-156.